« Vanagon – Q and D head replacement – am I winning? Catching up on my progress. I spent yesterday (Sunday) adding the bits and bobs that go on the motor. Intake runners and plenum, coolant lines, oil cooler, PS bracket, alternator bracket, dipstick, etc. A bit of a disappointment when I fitted up the spare rear manifold and found that the end did not line up with the end of the new front manifold. Not even close. I thought that the rear manifold was the same for all 2.1 engines (apart from, perhaps, the small support clamp and bracket) but this one was nowhere near close to working. The angle at the end of the pipe where it meets up to pair with the front manifold was all wrong. I bought a new one today and it works, but needs some slight adjustment. But the real surprise yesterday was the coolant pipe that runs from the water pump forward along the left hand side of the engine to connect with the thermostat. I had forgotten all about it when painting other bits and yesterday, when I was going at it with the angle grinder powered wire brush I uncovered this. Wow eh? I think the paint was all that was protecting me from a massive coolant leak. Talk about lucky. This one discovery almost makes this entire ordeal worthwhile. I’ll talk about what I did about this in a later post. One more pic, before I put the rear manifold on. A personal issue has complicated things, but I hope to get this thing done in the next few days. This entry was posted on May 27, 2013, 10:49 pm and is filed under vanagon. You can follow any responses to this entry through RSS 2.0. You can leave a response, or trackback from your own site. good on you to offer the Pipe to Mr. Shooftie. I’ll be checking my coolant pipes. What also caught my attention was the reference to the Bostig conversion. I have an 85 weekender with high springs and was considering a Bostig conversion. Are you happy with the installation and performance? Please, poke and pick at rust bubbles/flaking paint. Thanks for the offer Ed, but I think I have a fix for the holy pipe. Honestly Ed, it was pretty well just rust and paint keeping the coolant in. It couldn’t have lasted much longer. Looking Great, I hope it runs as good as it looks for a long time. Paint and rust are keeping the coolant inside that pipe..
Changed 3 new pipes into my Van over 14 years..
Makes the SS pipe a viable alternative… at ~ $200. to protect from gravel spray…. 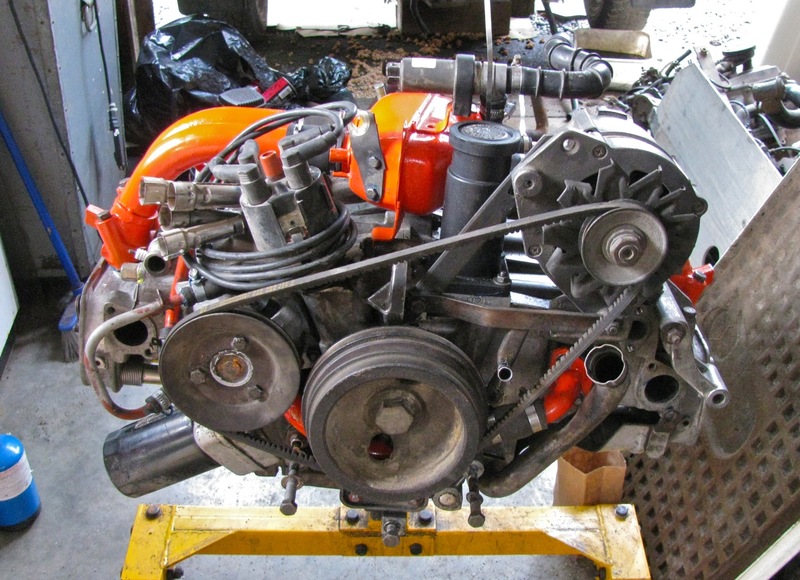 Nice colourful paint job on the engine ancillaries Alistair…. My fix, and it has been delayed, is another used pipe that has only one pinhole 🙂 I’ll be brazing that, then paint, and then if I can, put some sort of protection over the area. I was thinking of a debris/heat shield. The Chevy Orange paint was done just to brighten things up.